What is Hungarian Django Swing? 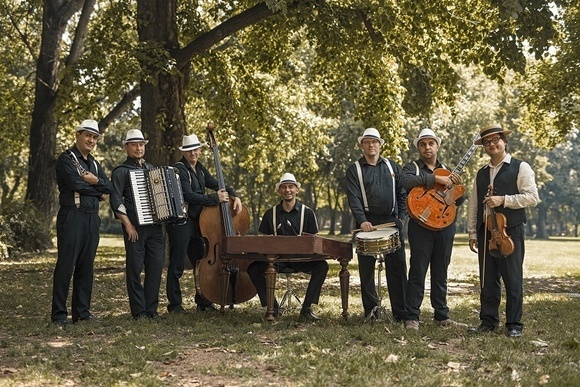 Swing à la Django is an innovative seven-membered band, which has showed its talents many times in Hungary and abroad as well. They have created a special style-mix in their music with the harmony of authentic Hungarian music, French chansons, world manouche swing, tango and jazz. This has resulted in a unique style, that they call Hungarian Django swing. At their concerts they go back to the roots, their music is inspired by Django Reinhardt, the greatest Belgian-born gypsy-jazz guitarist, and they try to follow the footsteps of Reinhardt to evoke the atmosphere of the 30s-40s. The musicians of Swing à la Django previously worked with Stochelo Rosenberg, Sting, Zubin Mehta, Andrea Bocelli and Roby Lakatos. They played in Carnegie Hall, New York; Opera Hong Kong; Royal Albert Hall, London; Montreux Jazz Festival, Switzerland and at the Montreal International Jazz Festival, Quebec. Last year the band had concerts in Brussels, Germany and Vienna. In Hungary, they traveled all over the country and had many full-house concerts in several concert halls (e.g. Budapest Jazz Club, Vigadó Concert Hall). In addition, they also performed their songs at the most important domestic festivals. The loudest success of 2017 was a major international production where they played together with Stochelo Rosenberg, the world-famous manouche guitarist and Roby Lakatos violin virtuoso at the Budapest Summer Festival.